Wine Down into the Weekend. Its tradition at LedgeStone. Bring your pals, bring your pups! We bring amazing local talent from the Fox Valley each and every Thursday night at the vineyard. June 27th starting at 6:00pm. We are embracing that it is summer and the music is on! We welcome Auralai to the vineyard and for those that have been LS groupies over the years - this name will sound familiar. Stephanie and Nate are coming in from Oshkosh to charm us with original music hitting straight to the soul. The duo brings various string instruments including the cello, bass and guitar. Come welcome back Auralai (A-lour-lie) to LedgeStone! Gather: June 27th, music starts at 6:00pm, winery opens at 4:00pm. Trade: The Wine Down into the Weekend music series is always free. Please NO BYO Beverages. Remember to bring your favorite blanket or chair as this is an outdoor event. In case of rain, LedgeStone will head inside. Food: LSV will have meat & cheese plates and Ali from Oley's Pizza will be on-site. Dogs: We are dog friendly as long as your dog is friendly. Please keep frodo outside and in the 'pet play zone'. Admission is free. Wine by the glass and select brews will be available for purchase, no carry in beverages. It's Thursday so what are you doin'? Attending Wine Down into the Weekend at LedgeStone Vineyards, of course! 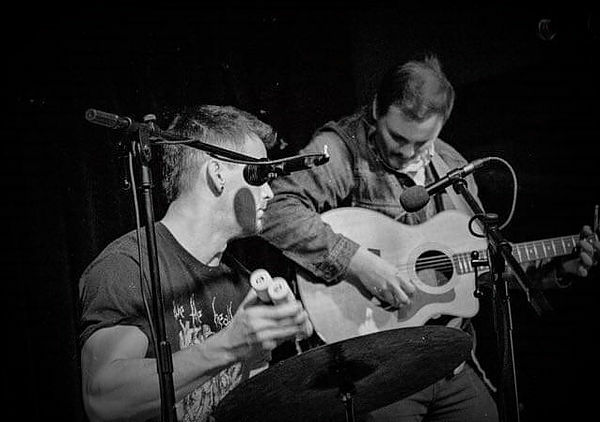 This week we welcome Kyle Megna and Dave LeBlanc from Kyle Megna & The Monsoons! Kyle on the guitar and vocals and Dave on the keys (that's right!) - this duo will be bringing you humor and rocking the crowd with a rock-indie-blues-whatever your feelin', we're playing - sort of night. The two are apart of a massive band but love getting down with some raw tunes and fresh music. Food: Ali from Oley's Pepperoni Cannoli will be firing up the pizza oven, Jeff with Smoked to the Bone on the smoker. LSV with Wine & Cheese. Dogs: If you bring a pet, please keep your friend outside and in the 'pet zone'. We are dog friendly only if your dog is friendly. Woof. Admission is free, $5 suggested donation. Wine by the glass and select brews will be available for purchase, no carry in beverages. Feed The Dog is a bluegrass icon in the Fox Valley area and we are smitten to present our Wine Down into the Weekend with the Duo rocking the stage. For this event, we'll have Amanda James, the talented singer and musician opening the stage, starting at 5:45pm. Rock on through the night and welcome FTD at 7pm. Food: Ali from Oley's Pepperoni Cannoli will be firing up the pizza oven LSV with Wine & Cheese. Well, Rob is back at the vineyard kicking off Wine Down into the Weekend and therefore, summer has officially began. Between his voice & guitar skills and our wine pouring skills (it's a thing guys!) - this is going to be evening that is special to us all. June 6th we bring back an old soul and a true original musician here at LedgeStone; Rob Anthony. Rob rocks it out with his own lyrical creations and throws in a few covers that the crowds are sure to know. He's true to the core and has been in the local music scene for over 30 years. Not only is Rob a talented gent but he is always pushing the youth in our area to understand the art & music scene and promoting what it takes to clue in on passion and make it real. Gather: June 6th, music starts at 6:00pm, winery opens at 3pm. Come early to grab a seat & a pre music bite to eat! • Local food truck vendors • Beer Garden • LSV 2018 Wine Release! Tickets can be purchased on the Eventbrite Link. Includes general access to the property, both music stages and the LSV Shake Down Artist Row. Lawn chairs/blankets welcome. No carry in food or beverages are permitted. GA Tickets increase in May, $25 and are $30 at the door (if tickets are available, this will SELL OUT!). BUS TRANSPORT: $15 Lamer's busses will be looping in Voyageur Park in De Pere and Tanner's in Kimberly (different busses). Fireman's Park: $5 about 1/2 mile from the vineyard. Walk, bike or jump on our shuttle bus. Included: Parking OR Round Trip Bus ticket from De Pere or Appleton. LSV indoor Tasting Room (VIP & musicians only) with air conditioning, bathrooms, seating. LSV drink tickets & special pricing, Guest local Chef with endless apps. Prices are set to increase in May if still available. Limited quantity. No parking on premise (unless VIP). Rain or Shine - we jam on! 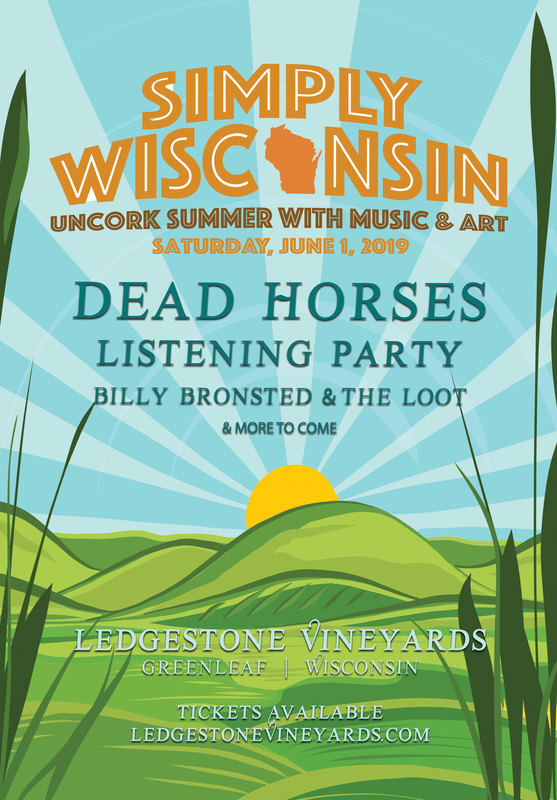 Dead Horses: For those unfamiliar with the group, Dead Horses' roots originate in Oshkosh, but have been touring nationally for the last few years. They one of those artists that strikes a tone of beauty, passion and pain with their music. It evokes a spiritual experience - an emotional fervor of love and happiness. DH plays at about 7:30pm on the main stage, right as the sun sets. Listening Party: Listening Party holds a special place in our hearts and are a permanent member of the LSV family (as they played at our wedding!). Their music brings a contagious energy - its awakens primal instincts that may find you howling along with each fast paced arrangement. 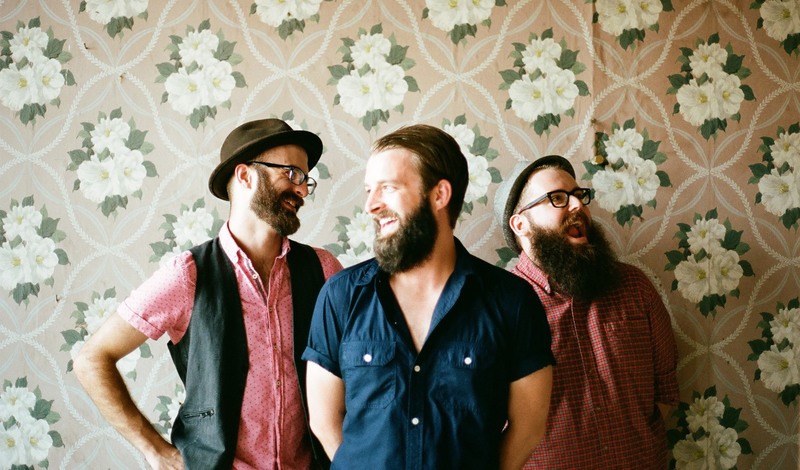 The upbeat boot stomping, jams ring true to Bluegrass/Americana purists. Billy Bronsted & The Loot: A humble man from the Northwoods, Billy Bronsted has a voice that fills the room and a smile that warms the heart. His gentle kindness comes through in his soulful performances, but don't let that sound fool you. He's witty, funny, and loving life.